At Richmond Hill Tree Service, we specialize in comprehensive tree services including tree trimming for residential and commercial properties across York region. As a leading tree service and landscaping company in Richmond Hill, we are dedicated to preserving trees and caring for your green assets for generations to come. Our licensed and insured arborists, tree technicians and gardeners do their best to create artful tree-lines that further increase the beauty and value of your property. We offer expert tree trimming services that will help keep your property gorgeous, healthy and hazard-free all year round. Tree trimming is an essential part of any landscape maintenance program. Regular tree trimming performed at least twice a year keeps your trees, shrubs and hedges in great shape. It is also a means to remove potentially hazardous branches, limbs and overgrowth. Routine tree trimming and pruning can spell the difference between an attractive landscape and serious property damage and personal injury. Richmond Hill Tree Service is here to help you maintain attractive, safe and well-kept grounds. 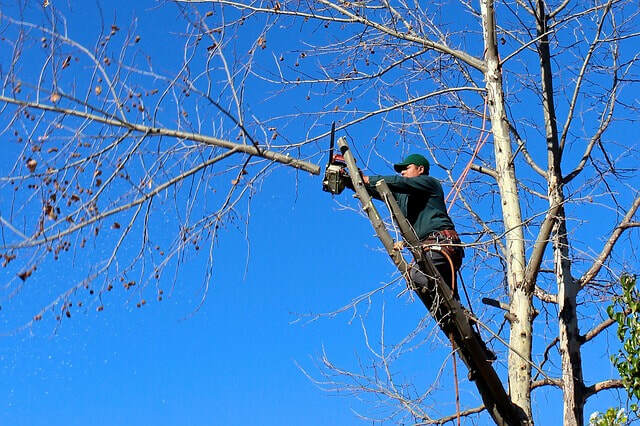 We recommend tree trimming be done at least two times a year, preferably during the dormant season. Keep in mind that tree care is about the individual health of the tree and trimming schedule may differ from one species of plant to another. Richmond Hill Tree Service also offers emergency tree trimming and tree removal especially in cases where there are signs of disease, rot or dying tree limbs. These needs to be addressed immediately as diseased trees can become weak, brittle and prone to breaking off and falling. This can pose a threat to structures as well as people. If you suspect a tree is diseased or dying in your property, contact us and our fully licensed tree specialists will be happy to help! Promotes a healthy, clean looking, well-maintained yard. Maintains the beauty and shape of your trees, promoting good health, vigor and stability. Tames excessively dense foliage that can block sunlight and moisture from reaching the rest of the landscape. Provide necessary clearance from power lines, utility wires and signages. Tree trimming reduces debris from overhanging trees and shrubs that can cause unnecessary weight and damage to your roofs, gutters and fences. Over extended limbs and branches provide tree creatures like raccoons and squirrels easy access to your property. Routine trimming prevents wildlife from easily entering your home through the windows, eaves, attics, roof, gutters and other possible points of entry. As a local York Region tree trimming specialist, we take great pride in our work and make sure to provide high quality service with each job, no matter how big or small. We place a high value on the safety of our crew and come fully equipped with the necessary tools and safety equipment. Combined with our knowledge, experience and trusted equipment, we can trim your trees, shrubs and hedges safely and effectively in the shortest possible time. Our friendly and courteous crew will make sure that the job site is kept clean and spotless, completing the job while preserving the beauty of surrounding landscape, shrubs and flowers. For more information on routing tree trimming in Richmond Hill and York region, give us a call at 647-490-9067 or send us a message on this page and get FREE estimate.